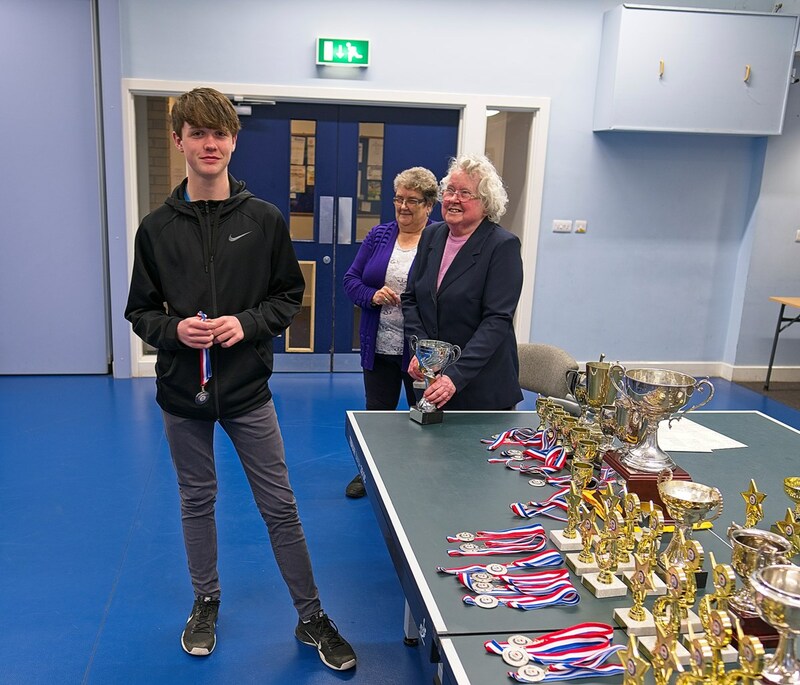 The Senior Tournament was held at Kidlington Forum on Sunday, April 29th and attracted 29 entries. This number is around capacity for a four table venue. Play began with the Veterans’ Singles Groups and the Ladies round-robin. 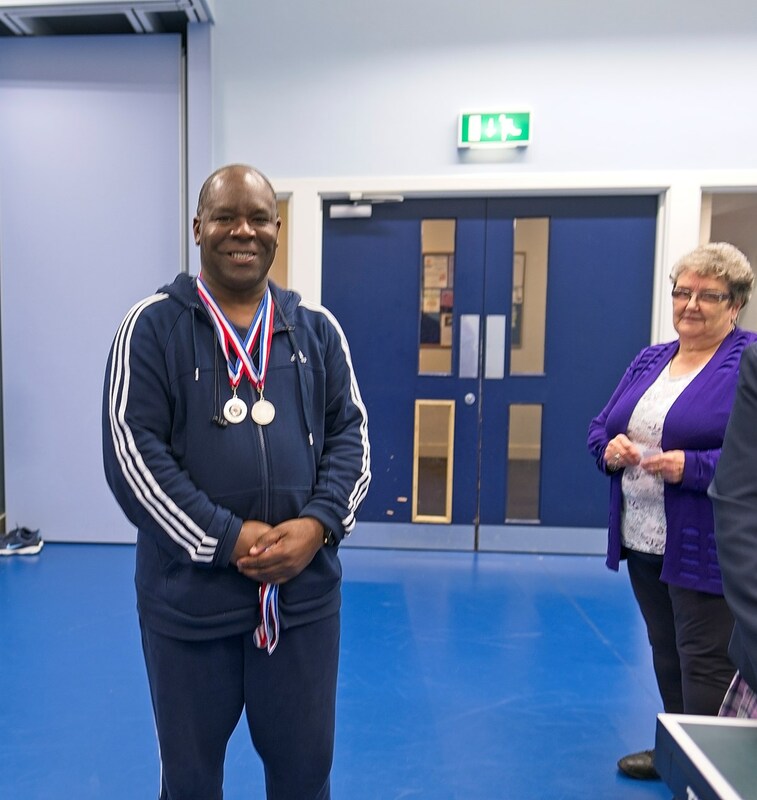 It was a delight to see the stylish Roel Dullens (RAL) back in action after injury and, although he lost out to Justin Roake (Gladiators) and Karl Bushell (Kidlington Forum), he came into his own later in the day as doubles partner to both Dom Juiwong (Vikings) and Sharon Curtis (Holton). In the other Vets group Damon So had a good win over Farshad Shaddel and qualified, along with Elson Costa (all Forum). In the semis Damon lost to Karl, and Justin lost to Elson, setting up the predicted final which went Elson’s way by a surprising 3-0 margin. Elson Costa in action - where's the ball? The Ladies’ quartet was less predictable and produced an excellent, close-run competition. 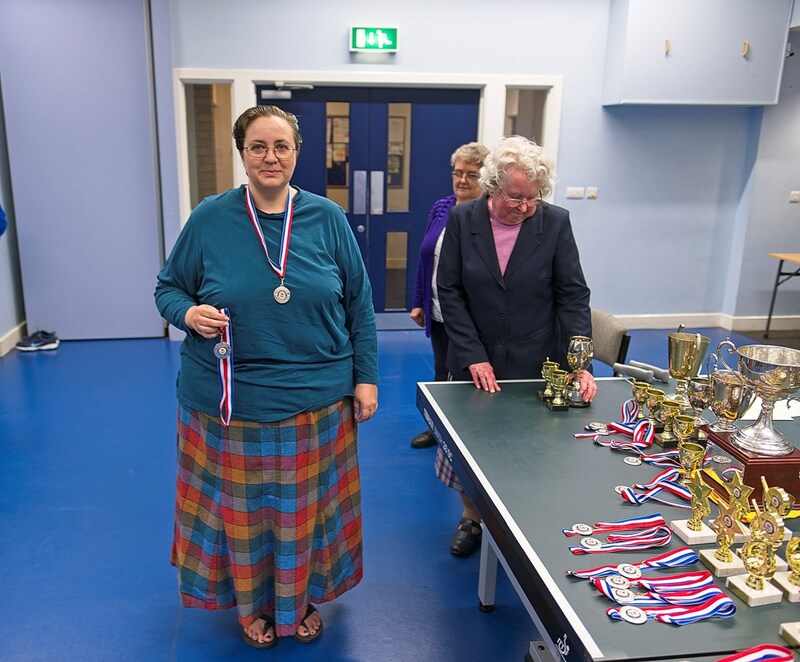 Dawn Pearce (Begbroke) beat Vicky Coll (Forum) in four, but the key result was her defeat at the hands of junior Christelle Rajapaksa (Bicester), also in four. Vicky had a sticky start, all at sea against Sharon Curtis, but contrived to win the last three games 9, 8, 9. 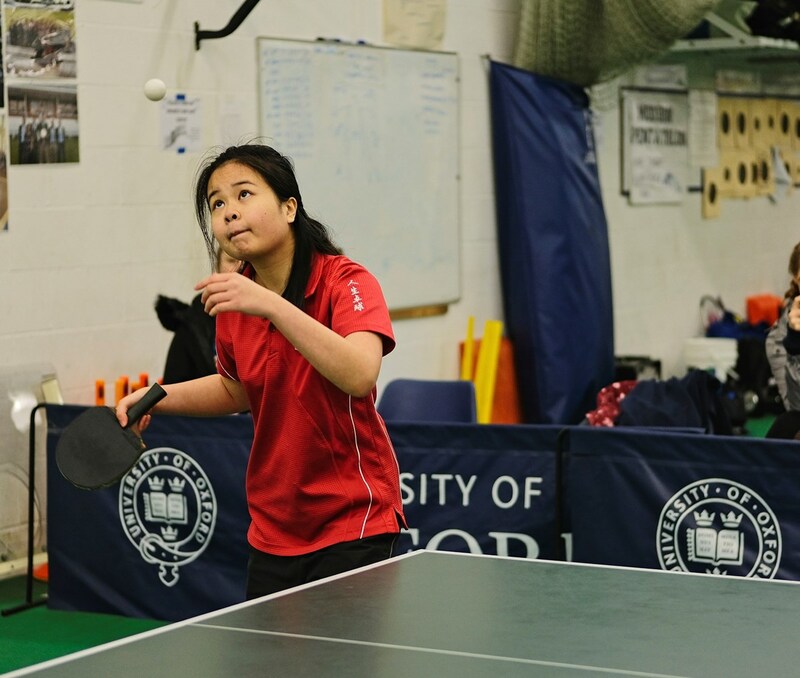 It all boiled down to the final duel between the two junior girls, who are very closely matched and always have exciting last-ditch games: this time Vicky went 2-0 up, but Christelle’s fighting spirit somehow prevailed, 16-14, 11-3, 12-10. Had Vicky won, which could so easily have been the case, we would have had a three way tie. 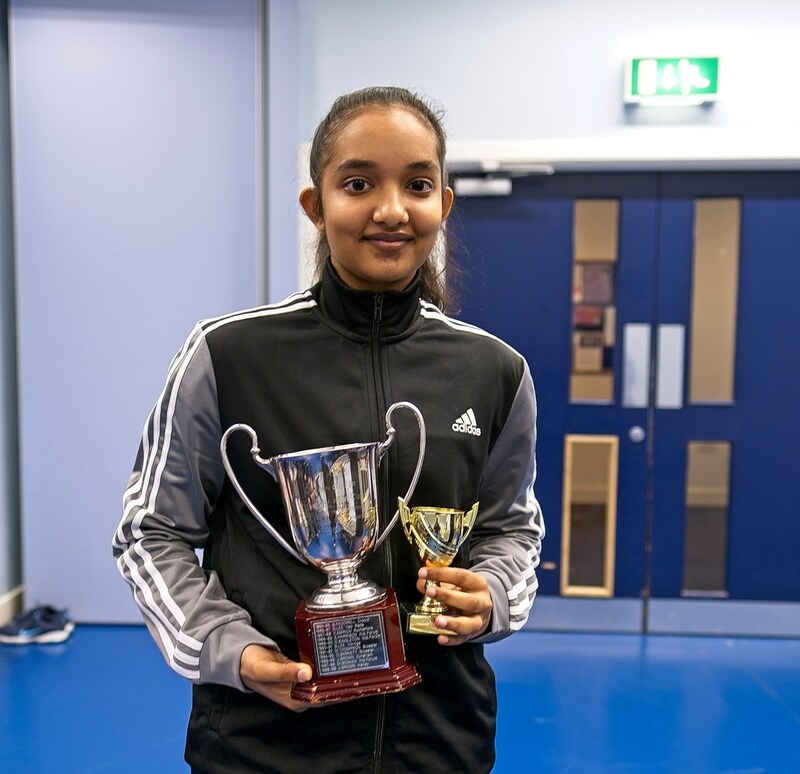 As it was, Christelle recorded her third victory to win the Chandler Cup outright. It’s wonderful to see these two determined young ladies improving so rapidly. 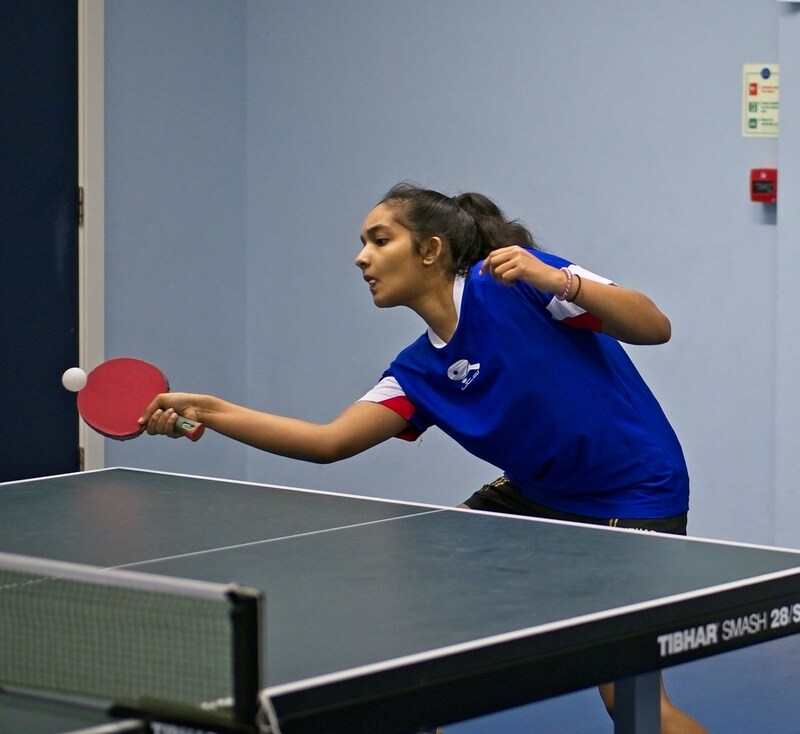 Christelle Rajapaksa, who came to Bicester via Sri Lanka and Paris, demonstrates a textbook forehand push. 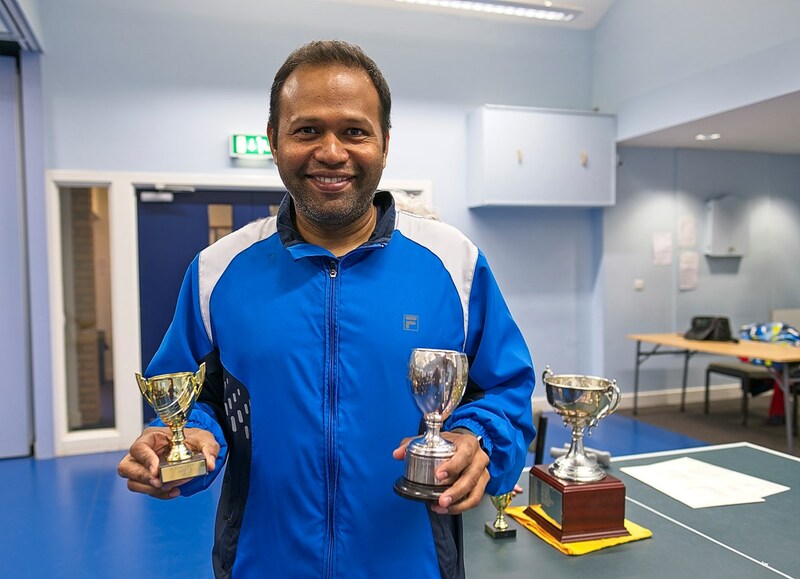 The tournament has been held together in recent years by an influx of lower league players taking part in the Restricted (Handicap) Singles. This year was no different, with 6 groups of 3 players attempting to fathom out not only their opponents but a complicated handicapping scheme based on the old-style best of three games up to 21, with the stronger players kicking off with a minus score equal to their opponents’ plus score. From the start it looked as though two Polish newcomers, Kamil Szuchalski and Pawel Zukowski (Forum), might be able to hit through any handicap, but in fact old hand Guy East (Forum) eliminated Pawel in the groups. Kamil did win his group and was joined by Clive Westbury (Gladiators), Christelle Rajapaksa, Vicky Coll and Jamie McNeil (Forum), who just got the better of Mark Pursey (Holton). Kamil went on to defeat Guy 21-17 in the 3rd. The other quarter-final also went the distance, with Jamie eliminating Clive 21-15. Jamie then made it to the final by beating Christelle 21-17, 21-20. In the other semi-final Vicky started slowly, unable to return any of Kamil’s serves, but the tough handicap soon became too much for Kamil. 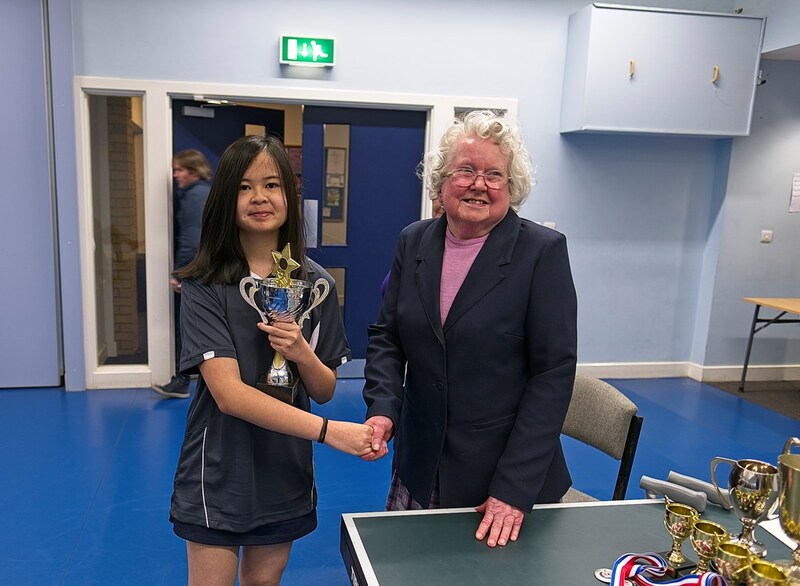 The final saw a splendid counter-hitting battle between two sixteen year-olds, with Vicky holding on to her handicap lead of 6, winning 21-15, 21-17. 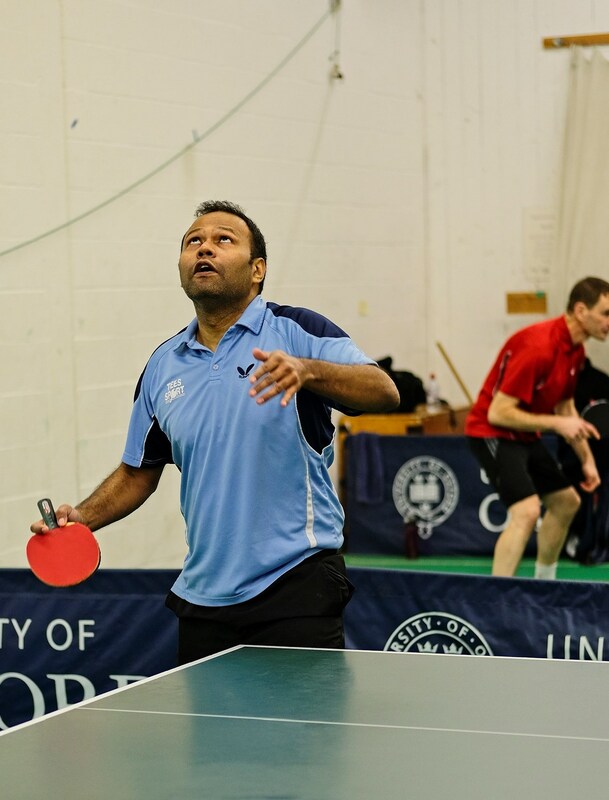 Jamie McNeil was also prominent in the Men’s Singles, defeating Justin Roake in straight games to qualify for the quarters behind Kamil Szuchalski. Junior Lewis Waddup (Forum) won a close battle against Roel Dullens and proceeded to put up a brilliant display against Karl Bushell, losing two deuce games before taking the third 11-6 and going down in four. The other qualifiers were Fraser Harris, Pawel Zukowski, Elson Costa and Paul Mabbutt (all Forum). There followed straight game victories for Karl and Elson, and 3-1 results for Fraser over Lewis and Kamil over Pawel. In the semis Karl beat Kamil decisively, but Fraser came close to taking Elson to a decider. The final was spectacular, the climax of the day, with Karl fighting back to level at 2-2, and Elson saving match point in the 5th in a scintillating rally, going on take the Oxford Mail Trophy for the second time by defeating Karl 14-12. It remains to report briefly on the three doubles events. The Men’s Doubles was one way traffic for the Forum pairing of Karl Bushell and Fraser Harris, who conceded just a single game to Kamil & Pawel. 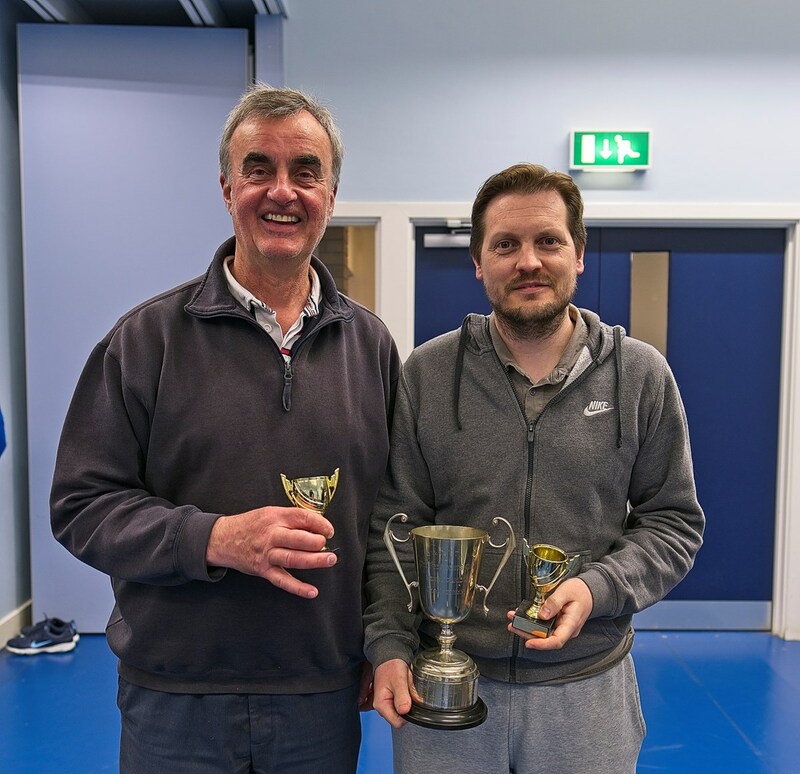 Runners-up were Paul Mabbutt & David Browne (Forum), turning back the years, with Paul’s vintage backhand returns setting up David for some powerful winners. 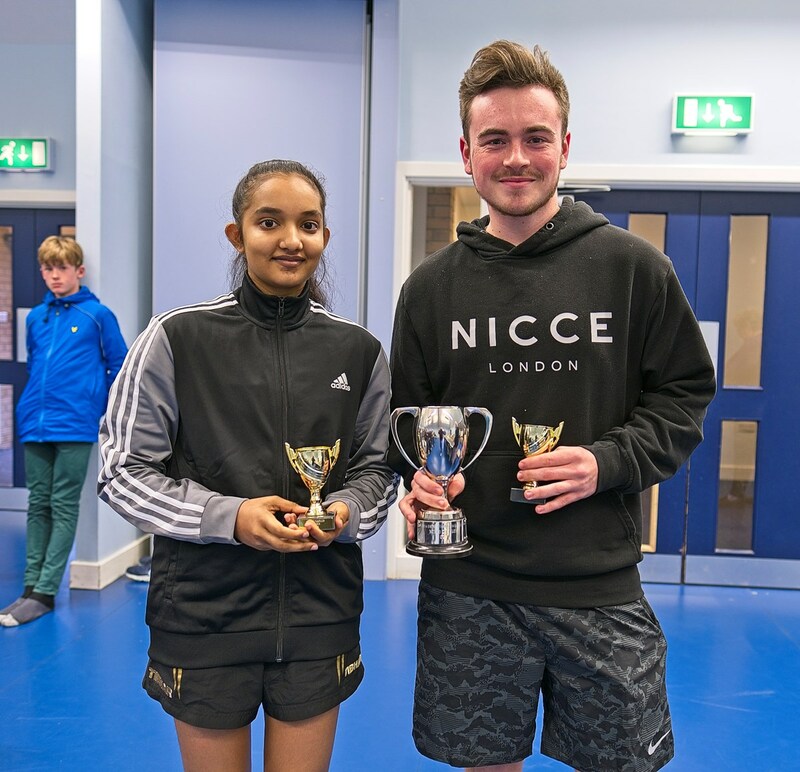 Lewis Waddup & Christelle Rajapaksa resumed their fruitful partnership from the Junior Championships, squeaking home 11-9 in the 5th against Fraser Harris & Vicky Coll to win the event on countback over Roel Dullens & Sharon Curtis. This was a remarkable achievement by the two dedicated juniors. There were eight pairs in the Handicap Doubles, which saw an intriguing final between the experienced father and son partnership of Guy & Jake East and David Browne & Paul Mabbutt (whose last major doubles title came in 1981): after losing the first 18-21, Guy & Jake combined wonderfully well to prevail 21-15, 21-18. As always thanks go to the Forum club for staging the event and to Karl Bushell and his helpers for having set up tables, curtains and surrounds before the organiser arrived. We are lucky to have this facility and on this occasion we were able to use it to full capacity. Sharon Curtis (Holton) was a runner-up in the Mixed Doubles with her partner, Roel Dullens (RAL). 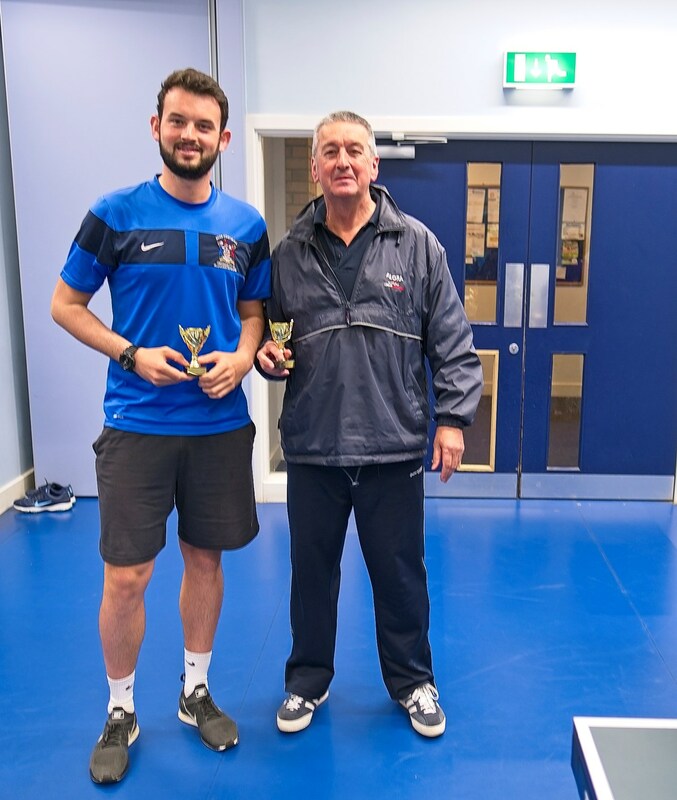 David Browne combined superbly with Paul Mabbutt to turn back the years and finish as runners-up in the Men's Doubles. Also pictured is Sheila McKechnie, our much esteemed Trophies Secretary.